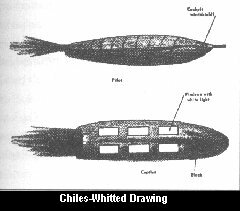 A classic UFO event that has all but been forgotten is the Chiles-Whitted sighting which unfolded over Montgomery, Alabama on July 24 1948. 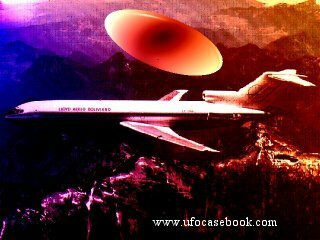 This case was one of the very first reports of a large UFO officially made by commercial airplane pilots. The experience was a one of a kind for the two seasoned pilots, Captain Clarence S. Chiles, and co-pilot John B. Whitted. While flying an Eastern Airlines DC-3 from Houston, Texas to Atlanta, Georgia they encountered a huge cigar-shaped UFO which barely missed them. This extraordinary event transpired while the DC-3 was cruising 5,000 feet above the city of Montgomery, Alabama. The first part of their journey was a pleasant, uneventful one until 2:45 A.M. Their relaxed cruising mode was suddenly interrupted by the sight of what seemed to be a dullish-red glowing object, directly in their flight path. Still at a distance, the two pilots first impression was that they were looking at a jet, unreported, and coming right at them! The glowing object barely missed them, passing on their starboard side at a distance of about 1,000 feet, according to Chiles. Whitted would later estimate the distance at somewhat more than Chiles' guess. The two pilots both agreed that the object had no wings or tail section. Both also agreed seeing at least two rows of windows from which appeared a glowing like "burning magnesium." The object had a pointed nose section, and there was a "bluish glow" running on it's belly from nose to it's end. Out of it's rear end, an "orange-red" exhaust was seen by the two unnerved crewmen. This so-called emission was as long again as the object's body. Both pilots were also in agreement that the object's length was approximately that of a B-29 bomber, though somewhat thicker. Captain Chiles' first reaction was to turn his DC-3 off to the left, as the object seemed to be coming slightly to his right. Both pilots clearly witnessed the oncoming craft do an abrupt pull-up, just after missing them. Only Whitted was able to view the object as it seemed to momentarily disappear after making a rapid vertical ascent. When asked later to elaborate on his description, he added, "the object vanished instantaneously after its sharp pull-up." The unusual object and it's dash at the DC-3 was fully reported to Eastern officials and Project Sign. Some further details were made available in this report. The two pilots stated that "no disturbance was felt from airwaves, nor was there any wash or mechanical disturbance when the object passed." Other witnesses would later disagree with this statement, and in the Naval Intelligence Report of the incident, it is stated by at least one of the passengers that the "DC-3 was rocked by the wash from the object." Witnesses also describe a sound like that of a V-2 rocket. Most of the passengers were, fortunately for them, asleep at the time of the occurrence. Clarence McKelvie, who was assistant editor of the American Education Press at Columbus, Ohio stated, "I saw no shape or form. It was on the right side of the plane, and suddenly I saw this strange, eerie streak out of my window. It was very intense, not like lightning or anything I had ever seen before." Chiles, Whitted, and McKelvie were not the only observers of this strange sight that morning. Several witnesses from Robbins Air Base, near Macon, Georgia stated they saw an object of the same description about 1/2 hour before the DC-3 sighting. The object was reported as travelling in a southerly direction at a high rate of speed. An official government investigation ruled out the possibility of a conventional aircraft after tracing flight records of 225 civilian and military flights that morning. Private debunkers, with no consideration of the facts, wrote the sighting off as an illusion due to temperature inversions, and then later assigned the sighting to a meteor. Project Sign would agree on the meteor theory, but in usual fashion, added that the description of the object and it's maneuvers did not match that of a meteor. This near-collision is still listed under the "unexplained" category.